For Percepta, the key to creating a customer-focused strategy is ensuring that across all touchpoints, our focus is always the same – the customer. It may sound simple, but it can be easy to forget the impact that a frictionless customer experience can have on a brand. Our consultancy services are designed to ensure the customer is always at the heart of our Clients’ business and we work in partnership to design and deliver a strategy that fits the needs of the customer and the needs of their business. As part of a customer-focused strategy, offshoring, or right shoring, can add immense value to the delivery of an operation. 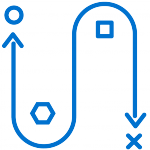 This could be anything from the centralizing of a number of previously siloed operations to enhance delivery or setting up a low-cost center for operations. Over the course of our experience, we have implemented a number of offshoring strategies, each one designed to focus on enhancing a specific element of our Clients’ business. For example, we have successfully utilized the Philippines for Front Line Customer Contact in the USA, and created a centralized Customer Relationship Center (CRC) in Thailand, serving Indonesia, Vietnam, Philippines and Thailand. 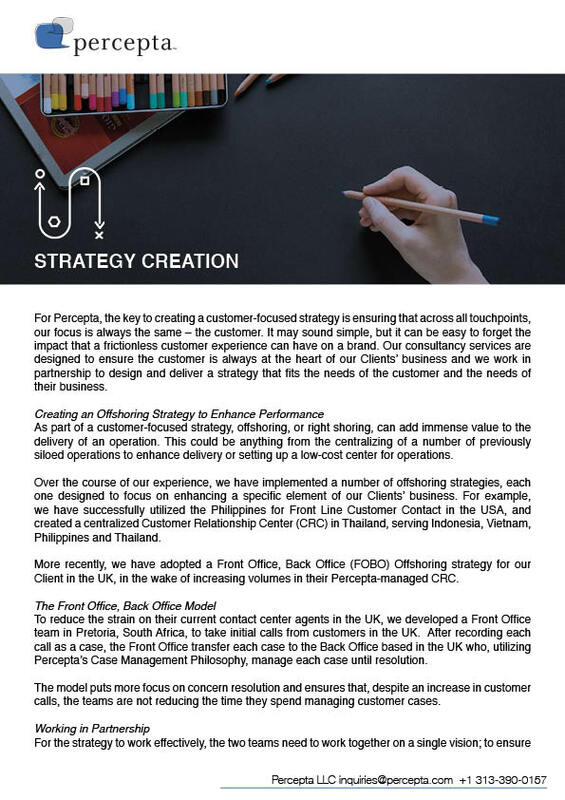 More recently, we have adopted a Front Office, Back Office (FOBO) Offshoring strategy for our Client in the UK, in the wake of increasing volumes in their Percepta-managed CRC. To reduce the strain on their current contact center agents in the UK, we developed a Front Office team in Pretoria, South Africa, to take initial calls from customers in the UK. After recording each call as a case, the Front Office transfer each case to the Back Office based in the UK who, utilizing Percepta’s Case Management Philosophy, manage each case until resolution. The model puts more focus on concern resolution and ensures that, despite an increase in customer calls, the teams are not reducing the time they spend managing customer cases. For the strategy to work effectively, the two teams need to work together on a single vision; to ensure the customer’s experience remains as frictionless as possible. Constant effective communication between the two teams is essential, ensuring that every call taken and subsequent case created by the Front Office is successfully handed over to the UK team and no one slips through the net. Ensuring that both teams took time to learn about the two very different cultures was also a vital part of delivering success. This kept each employee motivated and empowered to deliver their part of the strategy with excellence. The new set up also required a change in training styles, with teams in South Africa learning directly from our experts in the UK and vice versa, via a range of online tools and webinars. Throughout the entire process it was vital that each team member had a clear understanding of the role they play in the FOBO strategy, which would help drive good consistent behaviors across both centers in the longer term. For us, measuring the success of the project meant understanding the impact both on the customer and the business. The length of time taken to successfully manage a customer case reduced, as well as the number of “repeat” calls (when a customer has to phone twice over the same concern). Both these results highlighted that a dedicated case management function ensures cases are managed more effectively (and therefore a lot quicker) with time to follow up with customers at every step of the way. The FOBO strategy also impacted on other teams across the CRC – we identified a reduction in calls from our Client’s dealers seeking help with customer concerns, a direct impact of a more effective case management process. Overall, the strategy, which successfully utilizes South Africa as an offshore location, allows us to continually drive efficiency and deliver excellence to our Client, amidst the increase in customer contact.